Potters need to concern themselves with the thickness with which they apply each glaze they use. 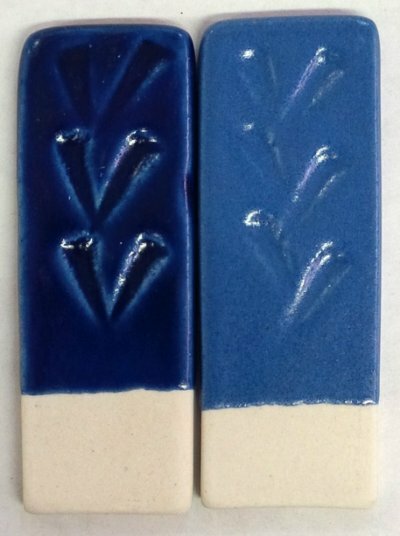 There are different thickness considered correct depending on the application and glaze type. Generally, in pottery, glazes need to be thick enough to get the desired visual effect but thin enough to avoid defects (like blistering, crazing, pinholing). An example of the importance of allowing a bisque piece to dry before glazing the outside face. 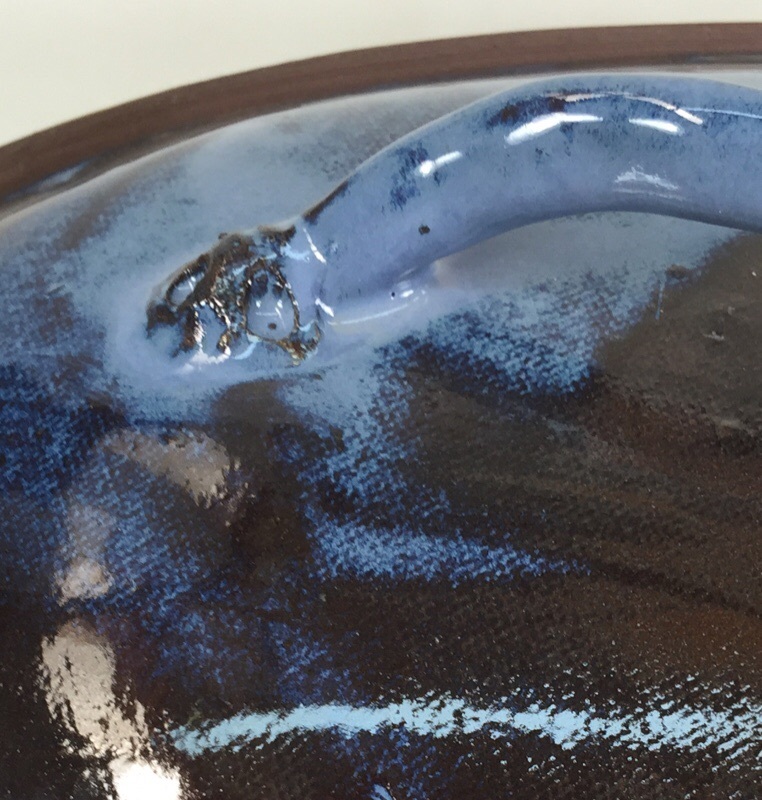 This hand-built caserole lid is thin and was glazed on the inside first. That wetted the bisque enough that when the outside was poured there was not enough absorbency remaining to build a sufficient thickness on some of the areas of thinner cross section. The problem is exacerbated by the fact that the underlying red body is darkening the color of the thinner glazed sections. Should I glaze the outside of this mug now? Why no? 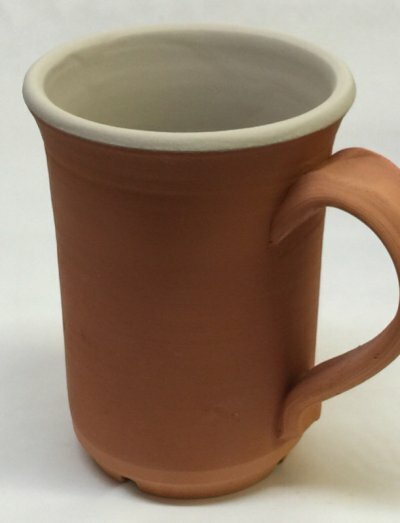 This bisque mug has been glazed on the inside. But the bisque has absorbed water from that glaze and this thin walled mug is now water logged as a result (except at the thicker base). It does not have the absorbency needed to build up a thick enough layer of glaze on the outside. Even if it did, the water from the two glazes would wet the bisque so much that its drying time would be greatly extended. This is a problem because the mechanism of attachment of glaze to body is fragile and works best when the glazes dries quickly (if drying is too slow bubbling and cracking can result). This is the Ravenscrag slip cone 6 base (GR6-A which is 80 Ravenscrag, 20 Frit 3134) with 10% Mason 6006 stain. Notice how the color is white where it thins on contours, this is called "breaking". Thus we say that this glaze "breaks to white". 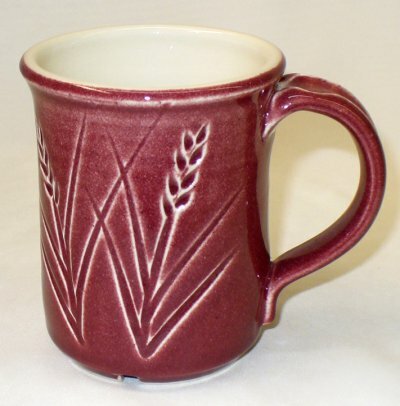 The development of this color needs the right chemistry in the host glaze and it needs depth to work (on the edges the glaze is too thin so there is no color). The breaking phenomenon has many mechanisms, this is just one. Interestingly, this transparent base has more entrained micro-bubbles than a frit-based glaze, these enhance the color effect. Why does the glaze on the right crawl? This is G2415J Alberta Slip glaze on porcelain at cone 6. Why did the one on the right crawl? Left: thinnest application. Middle: thicker. Right thicker yet and crawling. All of these use a 50:50 calcine:raw mix of Alberta Slip in the recipe. While that appears fine for the two on the left, more calcine is needed to reduce shrinkage for the glaze on the right (perhaps 60:40 calcine:raw). 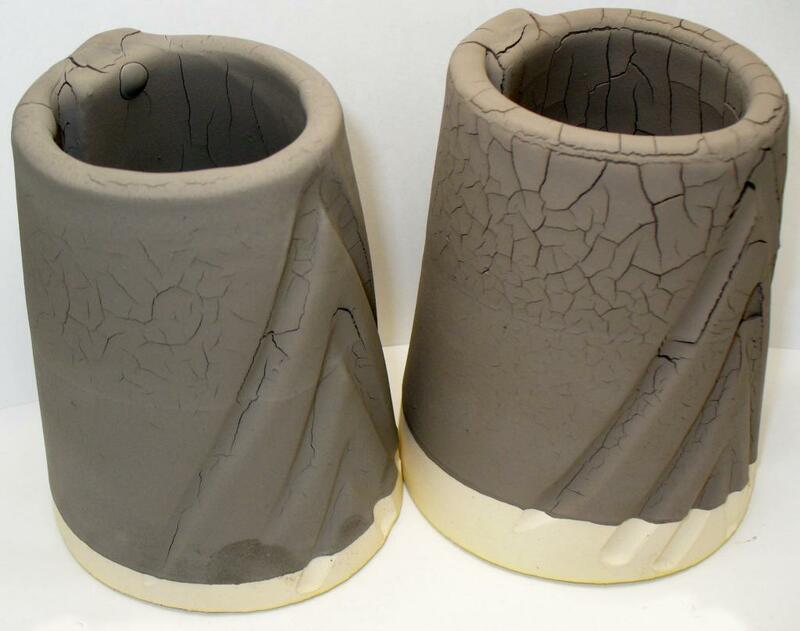 This is a good demonstration of the need to adjust raw clay content for any glaze that tends to crack on drying. Albertaslip.com and Ravenscrag.com both have pages about how to calcine and calculate how much to use to tune the recipe to be perfect.